With the Bruce Natural Laurel Strip Oak 3/4 in. x 2-1/4 in. 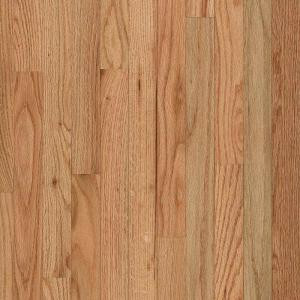 x Random Length Solid Wood Flooring (20 sq. ft./case) you can enjoy the natural beauty of oak's rich, robust grain characteristics throughout your home. The strips have eased edges and square ends for a classic, linear look. It has a Dura-Luster Plus finish for durability and beauty. 20 sq. ft per case. Case weight: 59 lb.